The code generally consists of 3 or 4 numbers and a letter, although in some instances there may just be letters and no numbers. Examples include 1060L, BR, 0T and K148. If you are under 65, have one employer, no benefits and earn less than £100,000 then your tax code for 2015-16 should be 1060L. If the number part of your tax code is higher e.g. 1600 then chances are you won’t pay enough tax in the year and HMRC will want the tax back when they eventually catch up with you. If the number is lower, e.g. 950 then you may pay too much tax so you should query it and get it corrected as soon as possible. 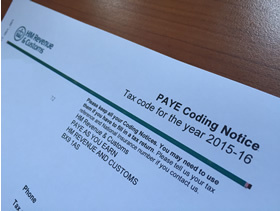 If you’ve received a notice of coding and you think it’s wrong ring HMRC straight away on the phone number on the letter. Explain why you think it’s wrong and they should be able to change it for you straight away based on your phone call. Alternatively give Joy & Co a call as we provide a code checking service and will be happy to help.